Cancer seems to be affecting nearly all of us somehow, so being part of finding a cure is a no-brainer. One group intimately involved is Lynnhaven Dive Center (aka Lynnhaven Adventure Outfitters) and ADS (Advanced Diving Supply/ADS Tactical). This year's D4AC, a two-day event at LDC beginning Friday, April 20, has a goal of $75,000 that is passed 100% to cancer research through sales, donations and auctions. One item in D4AC 2012 is a commemorative t-shirt. 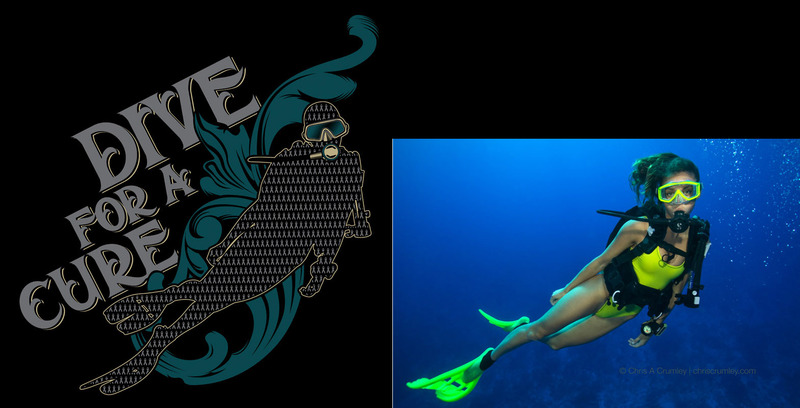 Robby Smolen, a graphic design talent at ADS, needed a diver silhouette or outline for his design, so I gave him a number of image choices from my 191,000 image database. The resulting graphic is the diver outline filled with the cancer ribbons we see everywhere. The SCUBAPRO-clad diver model is Christina Macfarlane. See http://www.ldcscuba.com for more information.